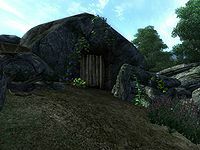 Cursed Mine is a medium-sized mine west of Skingrad containing bandits. 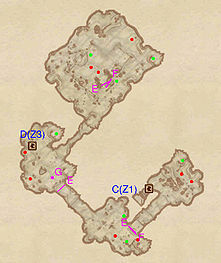 It contains three zones: Cursed Mine, Cursed Mine Breakdown Chambers, and Cursed Mine Lower Galleries. This mine contains 5 Cairn Bolete plants and 58 Wisp Stalk plants. When the Horse Armor official plug-in is installed, a new chest is added next to the easternmost chest marker in the Cursed Mine Lower Galleries. It contains the bugged object Horse Armor Plans. See the plug-in's article for more information. This bug is fixed by the Unofficial Oblivion DLC Patches. The chest is disabled and the Horse Armor Plans will be removed from your inventory. 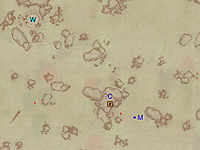 This location's map marker (M on map) is named Cursed Mine (editor name CursedMineMapMarker). The entrance door is WNW of the marker, 60 feet away. 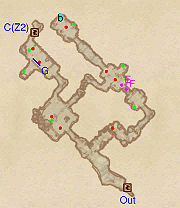 This zone is divided into two long pathways; the main route goes straight ahead to the Cursed Mine Breakdown Chambers and the hallway to your right leads to a dead end. Still, it is worth exploring the hallway to your right because you can discover four treasure chests here. Be careful, because after you enter the second room through a wooden door, there is a Swinging Mace trap hidden behind it at E. The left hallway is a currently unfinished mine corridor, so it leads to nowhere. If you looted the third room, you should backtrack to the cave entrance and follow the main route. 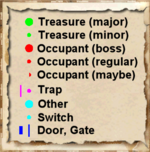 If you follow the main route, the first room you encounter is guarded by two enemies and offers one treasure chest. The second room is guarded by two enemies as well. There is a secret treasure chest hidden here; if you push the wooden planks three times at G, you can find it. Then continue on to the Cursed Mine Breakdown Chambers. This zone is mostly linear, with a small diversion at the end. The first room you enter is guarded by two Bandits, so be careful. Before you enter the second room you will pass a wooden shed. If you continue on straight ahead, you will trigger a nasty Falling Log trap at E. You can also pass between the two right pillars and nothing will happen! Dispose of the two Bandits that guard this room, and continue on to the third room. Before you can enter this room, you are forced to break a trigger wire which will cause a large Swinging Mace to swing down towards you. The third room contains the trap door to the Cursed Mine Lower Galleries. You can also enter the hallway to your right in this room. This leads to another large room, but the entrance to this room is trapped as well. Breaking the tripwire here will cause Falling Logs to fall down. This room always contains a Bandit Hedge Wizard. When you enter this zone you will have to fight two Bandits in the first room immediately. The second room is much larger, and you can try to take on the enemies one at a time. With the Horse Armor plug-in installed, there is a bugged item in a chest here (see notes above). The third room is the main base of the bandits. You can find three enemies here and the Bandit ringleader to your right. The Boss Chest is located in the tent of the Bandit Ringleader. This room is the only room in the mine to contain silver veins and at E there is a small stash of silver ore.